This week's lesson on the «Arte y cultura en circulación: crear y compartir en tiempos digitales» course talks about piracy and the circulation of culture, a topic that over time has been debated over and over. And a topic, yes, that can always lead to interesting discussions. So, I chose item #4: Cultural products have a high cost because their production is complex (and a tag could be made, linking complex with expensive). I think this item can lead to a long discussion as to what does this complexity and cost mean. Some cultural products do require quite a bit of investment, yes. Others don't. How do content producers make the jump to produce expensive works? If I am a new programmer/artist/writer/screenplayer/whatever, most likely, my products will be not very complex or expensive. I will start small. And if I excel at my work, somebody will look at me and, in some way, become my patron, my sponsor. Being a sponsor might mean that, based on the results of my good work, I could get hired as a software developer at a large company, or an editorial company would buy the patrimonial rights of my book/music (be it for a fixed fee or for a percentage of sales), or whatever. But the leap is not made quantically — A newcomer to the cultural scene will at first, most likely, have a hard time selling his products. At first, it takes convincing just getting people to take a shot at looking at your work («Hey, please take a look at my program and tell me what you think about it!», «Would you be interested in listening to my latest song?» — And those two are by far ahead of the first attempts where the interactions would more likely be «Turn off that $#^#!^ computer, it's well past bedtime» or «stop murdering that guitar, I'm having a headache»). Maybe the toughest part is to get people to agree to read/hear your work. And there, you start into a continuum — Selling your CDs while performing on the street, then getting to play to a bar, then getting somebody to want to produce (maybe even "discover"!) you. Publish some short stories in your school magazine, then in a "From our audience" section in a larger magazine, then a collective book, your self-published book, yet-unwritten books by contract... The same story over and over again, in each different field. Ok, yes, but... This logic succession still leaves space for the Important Producers with the Mighty Big Pockets for the most wanted/largest productions, right? And were unauthorized distribution (piracy) to be the norm (as it currently is, dare I say), wouldn't they stop producing an important portion of cultural works? I'd be tempted to say so. However, a different actor comes into play. When Mighty Big Pockets comes into play, they no longer worry only about getting money from each cultural creation, but from all derived uses of it. And the cultural creation industry (when seen as an industry) goes very much hand in hand with the advertising, marketing industries — They end up blending with each other. So, the biggest best sellers will most likely have a hit from illegal copiers. Books are still a great business, but hey — An even better business is (usually) movie making. And when you make a movie out of a great story, you will surely link some advertising into it (or at the very least, push advertising/product pushing campaigns to go after it). And there, illegal distribution actually helps the money circle to grow stronger. In the early 1990s, the link between dinosaurs and carbonated drinks was a top seller (because Pepsi™ was a Jurassic Park® sponsor). Although I have always loathed the madness around the World Cups (and basically anything that involves football of any kind), I can perfectly remember several of the theme songs for most of the world cups played during my lifetime. So, in short... No. Illegal distribution does marginally little harm to the money income to the cultural business, at any level. And where it does get some direct harm, it increases the money flux given the auxiliary channels. As I slowly read my good friends wishing each other a good trip, telling they got home safely, and the IRC channels form thick drops of a bitter-sweet etheral substance, I cannot help feeling DebConf13 is over — For me as well, from the distance. Many friends gave me warm greetings, and without being there, gave me that beautiful feeling of real community that Debian has given me for ten years already, since I met in real-life many of its developers at DebConf3 in Oslo. 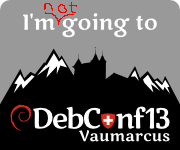 And –yes, I have stated this far too many times– I have attended every DebConf since (and worked organizing most of them). This year, over 300 people were gathered in Switzerland to enjoy the always most intense weeks of the year. This year, I was unable to attend due to calendar clashes. Even so, without the stress that organizers have, and thanks to the great work of the always-loved Video Team, I think I was able to be present at more sessions than at in any of the last few years. Oh, and for the readers of this blog who were not there — Do you want to follow what was presented? You can download already the videos for all of the recorded presentations (that were, due to the planned coverage and the manageable size of the Video Team, about ⅔ of the total scheduled sessions). And, as always, I was able to follow many very interesting talks and take part of a couple interesting meetings/BoF sessions. I still have a bit of catchup, partly due to the timezone difference (I was only at one of the sessions during the Swiss morning, at 02:30 local time, the pkg-ruby-extras team BoF). But, hey, wait! During a chat in the course of DebConf, a friend told me a bit worried that all this beauty and fun might make our dear and very important sponsors they are paying for a geek vacation, is it so? No, not at all. Not by a long stretch. And just looking at those same galleries makes it clear and obvious. After all, it's widely known that Debian is the operating system for the gurus. Simple: It's impossible to have all those geeks without getting amazing work done, in ways that even seem clichés (this last photo had Joey Hess explaining dpkg format version 3.0 (git) ideas, sketched after waking up at 3AM on the first sketching surface available to him). After all, Debian people are famous for their inclination to use any excuse to open their computers and hack away. We can find Debianers hacking in small spaces and also hacking out in the fields. But this time, people were able to hack indoors while enjoying the nature and hack outdoors under a tree. And, yes, one of the things that makes organizing DebConf worth it is, after ≈eleven months having low-bandwidth meetings over IRC, having the opportunity to plan for the next days face to face, in a relaxed but work-full environment. Anyway, here at home I didn't sit idly just longing over them. How could I? We are just celebrating the Debian Project's 20th anniversary! http://gwolf.org/content/jonathan-host-and-organizer-rancho-electr-nico">Jonathan, a Debian enthusiast, student at my university, and collaborator for several free software-related collectives in Mexico City, invited me to the celebration at Rancho Electrónico (which I recently mentioned in this same blog). While I was unable to stay for the whole celebration, we had a very good time; I talked about some ways on how to contribute to Debian. Although I didn't have much of a presentation prepared for it, I feel it was successful and interesting for the attendees — I just hope to start seeing some of them get into any of the ways for helping Debian soon. I also stayed as a listener and ocassional commenter for a talk on the Debian Project's history and goals, and to a presentation on a nifty electronic music programming tool called Supercollider (of course, available in Debian). Now, "regular" life should continue. For some value of "regular". 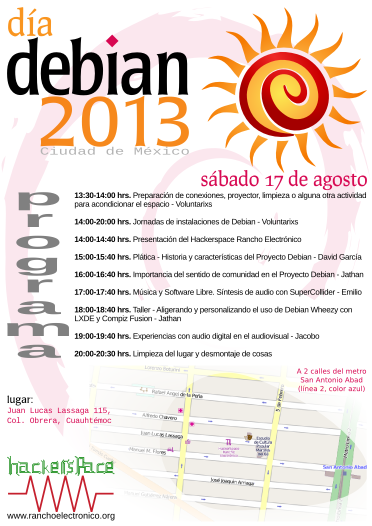 Jonathan came up with a large chunk of the organization for Debian's 20th anniversary celebration at Rancho Electrónico. Thanks! Not in Switzerland — But still, cheering for Debian's 20th anniversary! This is the first DebConf I miss in ten years, so... Yes, it's a big bummer for me. I'm not attending because this year, DebC(amp|onf) coincide with the two first weeks of classes at my university — And as a new teacher, I cannot afford to miss it! Anyway, but that should not stand in the way to attend a nice Debian 20th anniversary party! Don't you yet know the hackerspace? You should go there! It's in a very centric location, just two blocks West from Metro San Antonio Abad (Juan Lucas Lassaga 114, col. Obrera). And the only two times I have been there, it has been good fun. Surely this Saturday we can have a nice party as well! The planned activities are from 13:30 to 20:30. See you there! 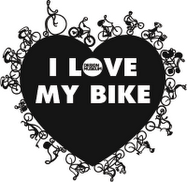 For all Spanish-speakers that read my blog, specially for the cyclists among you, and most specially for those that dwell in Mexico City's streets: I was recently pointed to a project started inside the Faceboook labrynth by Sandro Cohen, writer and academic: El zen del ciclista urbano. I met Sandro around twenty years ago. He writes in a very good, simple style. What I didn't know until now is that he has also become an urban cyclism promotor, just as me and many of my friends. In this page he started, he posts snippets on the topic of being an urban cyclist: As of today, he has 44 meditations, each of them a joy to read — And very instructive as well. Thanks, Sandro, for the great resource! [update] I always find it... almost funny to read comments by so many people saying they'd rather have a lobotomy than to cycle in Mexico City. Hey! Mexico City is among the best places for cycling! Yes, we have to keep our eyes open and our instincts awake, but... Most of the city's area is flat. Many avenues have wide lanes and span a long distance. And yes, although there are some careless or aggressive drivers, after six years with the joy between my legs I can just say that... things are not as bad as you might imagine. I have very few (thankfully!) bad experiences, and so, so many good ones!